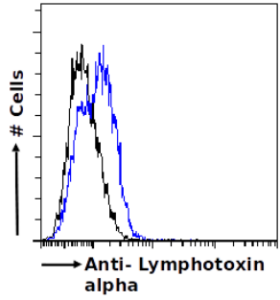 Recombinant monoclonal antibody to Lymphotoxin alpha. Manufactured using AbAb’s Recombinant Platform with variable regions (i.e. specificity) from the hybridoma 3F12.2D3. Immunogen: 3F12 was prepared by hyperimmunizing BALB/c mice with purified recombinant human LTα expressed in E. coli - the hybridoma clone was selected for its ability to bind LTα3 by ELISA. The CDRs of the antibody were grafted to the framework regions of the mice mAb 2G7 to create the chimeric version of the antibody. Specificity: 3F12 binds to human LTα3 and LTαβ (with a KD of ~0.3 nM, determined by BIACORE; ~ 37 pM, determined by ELISA) in both its soluble homotrimeric and membrane heterotrimeric forms. LTα belongs to the tumor necrosis factor (TNF) superfamily and is secreted as a homo-trimer (LTα3), or is expressed on the cell surface in complex with LTβ. Lymphotoxin is produced by lymphocytes and in its homotrimeric form binds to TNFRSF1A/TNFR1, TNFRSF1B/TNFBR and TNFRSF14/HVEM. LTα3 signaling induces target cells to upregulate many chemokines and cytokines in an NFkB-dependent manner. Application Notes: The properties of the chimieric 3F12 is equivalent to that of the original 3F12 mAb. 3F12 is able to bind to Th2 cells and additionally is can functionally block human LTα3 versus an isotype control (trastuzumab) - LTα3-induced ICAM upregulation is blocked on HUVEC (Human Umbilical Endothelial Cells) (IC50 0.04 nM) and LTα3-induced IL-8 is blocked in A549 cells. The antibody has also been used in ELISA studies to detect LT-alpha and to measure binding. Note on publication: Describes the generation of anti-LT antibody and compares binding specificity and affinity of the chimeric antibody against the original antibody by BIACORE and ELISA. 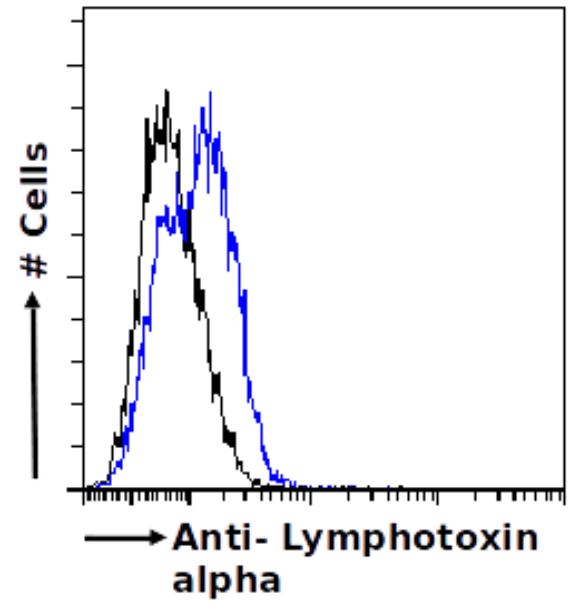 Flow-cytometry using the anti-Lymphotoxin alpha antibody 3F12.2D3 (Ab00788) U937 cells were fixed using 2% PFA, permeabilised using 0.5% Triton and stained with unimmunized rabbit IgG antibody (MOPC-21; isotype control, black line) or the rabbit IgG-chimeric version of 3F12.2D3 (Ab00788-23.0, blue line) at a dilution of 1:100 for 1h at RT. After washing, bound antibody was detected using a goat anti-rabbit IgG AlexaFluor® 488 antibody at a dilution of 1:1000 and cells analyzed using a FACSCanto flow-cytometer. WB on LPS-treated PBM lysate using Ab0788-23.0. 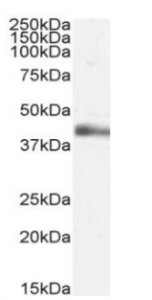 Western Blot using anti-Lymphotoxin alpha antibody 3F12.2D3 (Ab00788) Lipopolysaccharide(LPS)-treated human peripheral blood monocyte (PBM) lysate (35µg protein in RIPA buffer) was resolved on a 15% SDS PAGE gel and blots probed with the rabbit IgG-chimeric version of 3F12.2D3 (Ab00788-23.0) at 2 µg/ml before detection using an anti-rabbit secondary antibody. Protein was detected by chemiluminescence. The expected unmodified running size for Lymphotoxin alpha is 22.3kDa, though the form shown here is likely glycosylated. Ab00788-23.0 successfully detected Lymphotoxin alpha in LPS-treated human PBM samples.